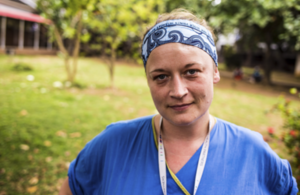 Watch British medic Stacey Mearns tell her story of fighting the disease in Sierra Leone. Doctor Stacey Mearns has been helping patients to battle Ebola since October 2014. She knows the job could cost her life, but she says there is nowhere else she’d rather be. Dr Mearns is part of the King’s Health Partners team at Connaught Hospital in Freetown - supported by UK aid. I’m inspired on a daily basis by the local Sierra Leonean health staff. Like me, they believe humanity is a greater thing than themselves. Thanks: Stacey Mearns, for her amazing work, the team at Connaught Hospital and King’s Health Partners.